As a former World and Olympic level competitor, Brian Orser had one of the most successful careers in skating history. Having coached three individual skaters to two Olympic and three World titles in six years, he knows a few things about preparing skaters for competitions. I sat down with him to talk about the strategies he used as a competitor and how he applies that knowledge to the skaters he works with. One of the most important elements of a competitive athlete’s regimen is a sound sleep. Orser recalled that, during the early years of his career, the nights before a competition were usually stressful and sleep challenged. In 1986, his coach, Doug Leigh, enlisted the help of Peter Jensen, a Canadian sports psychologist and an expert in relaxation techniques, to work with Orser. “Using a sports psychologist was unheard of back then. Peter is an expert in the use of hypnosis and visualization techniques and creating meditative-type states of mind to relax you,” Orser explained. During the almost two decades that Orser toured as a professional, hypnosis and visualization played no role in his life, but that all changed in 2006, when he transitioned into coaching. Orser wanted all of his students to own the visualization-and-relaxation concept and started talking to them about the successful techniques he had learned from Jensen. In 2010, Orser produced CDs for his students as a way to help them practice those techniques. Then, quite by chance, he connected with Asad Mecci, a successful motivational coach and respected hypnotist. They collaborated on a concept and, in 2013, developed the Peak Performance app, which, among other things, embraces the techniques that proved so successful for Orser. More than 700 skaters throughout the world now use this app as a training tool. Set procedures are in place for every skater at every level who trains at the Toronto Cricket Club. These include planning a season in advance, setting a training regimen, and increasing the number of clean program run-throughs that each skater must do as the season progresses. “I expect all our skaters who are training for competitions to be ready and prepared to do run-throughs, and I want those run-throughs to be clean,” Orser said. His students are also required to participate in mock competitions that take place before live audiences at various rinks around Toronto. “As we get closer to competitions, we hold simulations. Before we leave for them, we do a draw. We have judges and technical specialists and a 6-minute warm-up. After the events, their programs are critiqued, and we learn what will make things better,” Orser explained. He and the other coaches have nurtured a team-building mentality in the skaters they train, Orser said. “The younger kids are brought up to respect the elite skaters, and they can sense the tension before a big event. At the same time, when those younger skaters are running through their programs, preparing for a competition, they get the same respect from the coaches and elite skaters. “My skaters expect me to do certain things, such as wear a suit, create a schedule for the day, attend the draw with them, and specifically prepare for the time after the 6-minute warm-up,” he said. “I just stay calm and be my normal self. I don’t try to be funny or engage my skaters in excessive dialogue to distract them. Less talk is better. Orser said that it is more important to let his more experienced athletes take charge of their preparation at a competition. “My skaters decide when it’s time to go to the locker room and when it is time to go to and leave the ice. I never say, ‘I’s time to go; get ready.’ I keep it calm. I continue to follow the skater’s lead while carefully monitoring their body language. “After the 6-minute warm-up, we manage the time according to the starting order. For example, if they are the last to skate in their group, it might be 30 minutes until they skate. I always bring their shoes so they can take off their boots for a bit. I don’t work hard at having small talk. I just let them settle, but I am there for them. “Again, I follow each skater’s lead as to when they are ready to walk through the first half of the program. We chill for a few minutes and then walk through the second half. Elite skaters like having a plan for the time between the 6-minute warm-up and when it is time for them to take the ice. We find a quiet spot to wait but never hide far away from the ice. It’s a part of life to hear an ovation for another skater or to hear that there may have been some difficulties. Orser said it is important to know your skater’s habits at a competition. 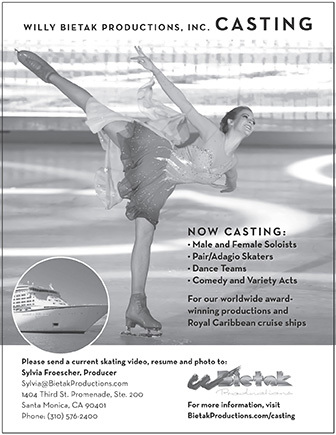 “My coaching team and I always find it interesting to note the specifics that our skaters bring to competition. Merry Neitlich is the director of the Coach’s Edge and can be reached at merry@coachsedge.biz.